The first month my videos were fully up and running I netted over $50,000 in sales; easily the best month I have ever had! People constantly provide positive feedback my videos and that they were a positive influence on their decision to hire me. My video easily brought about a 10x ROI in less than a year. It had an instant impact and our firm was profitable very quickly. Video is critical, especially for solo and small firm lawyers. 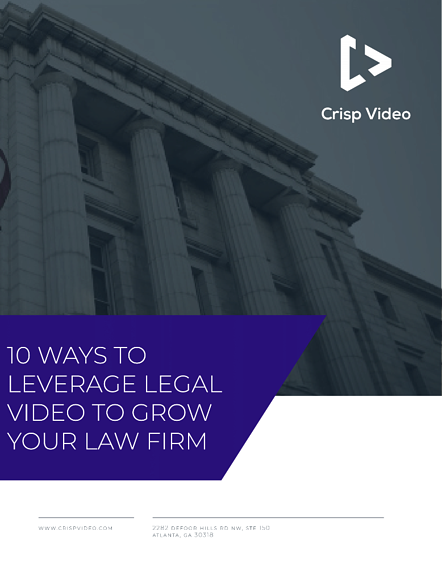 Crisp was terrific - they make you, your family, and your team feel comfortable, they have a ton of experience, and everyone I interacted with understands the value of video for lawyers. There's no other company in the legal space that's creating as compelling, high-quality videos as Crisp Video. Most importantly, they know how to help lawyers get results. Crisp Video has mastered the technique of telling YOUR story to YOUR jury, the public. A clear, concise, humble, real story in your words is the "secret sauce" of Crisp Video. I love their product and you will love their results. © 2017 Crisp Video. All Rights Reserved.